It was at once like coming home to an old friend and falling in love all over again. This isn’t a review really, although I will write about the production, it’s my collection of thoughts, reflections and mostly feelings after returning to something that has been intrinsically a part of my life for a long time. I will review it separately, but those thoughts belong somewhere else. For anyone who doesn’t know (and why would you, strangers of the Internet) I wrote a PhD on Rent. That’s right, I am Dr Rent. It’s not entirely about Rent, but it’s a major part. I don’t say this to preface my review as somehow more informed, or worthy. I say to to tell the story of how Rent came to be intrinsically entwined with my life. And how surprised I was to leave the theatre feeling the way I did. And how I felt was to be sitting on a freezing cold bench, desperately texting the friend in Chicago I knew would understand. And walking around in a daze trying to wrap my head around a thing I already thought I knew so well. So to backtrack some more. Way back in the mists of time I discovered Rent, as all musical theatre kids are inclined to do. The time lines of how, when and why are all a little blurry now. But eventually I made it to Broadway to see the show. I loved it, who wouldn’t. Interestingly it wasn’t that first time that had a profound affect on me, but I think the second or third. I remember so distinctly being sat in the Mezzanine of the Nederlander theatre, and being hit by a wave of emotion stronger than anything I’d felt before, in the theatre, and rarely have since. 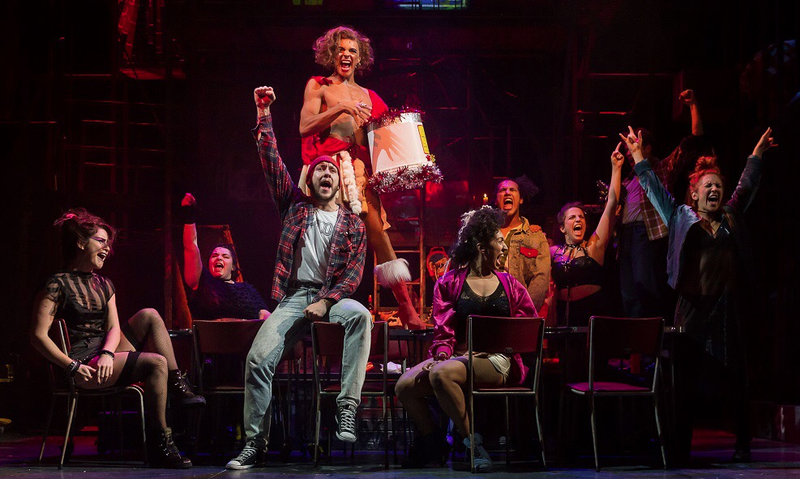 And although I loved Rent, as musical theatre fans do, it was that moment it really became a part of me that I’d never quite shake. It had been while then, when this Saturday I sat down to watch it once more. There’s a certain theatrical instinct you get, and you know something is going to be magical. And a few bars into the opening number I knew. By midway through the first act, I really knew. Years ago original cast member Anthony Rapp told me no matter the language he sees Rent in, if he cries, he knows it works. For me it’s a certain note- literally a note- in ‘Will I?’ midway through Act 1. If it’s working, at that moment it hits me. And it hit me. This production feels like someone has re-built the thing I thought I knew so well from the ground up again. 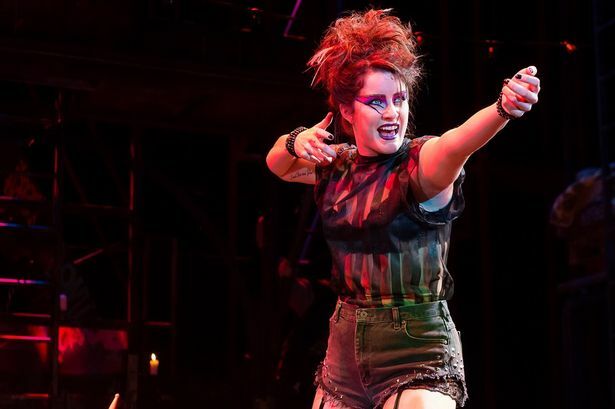 I knew that director Bruce Guthrie ‘got’ Rent having seen his production of it at RWCMD in 2013 and while there was a freshness to that production that unlike others didn’t feel it was mimicking the original, this new production feels, if anything raw. There is an energy and urgency to the direction and performances that feels like it taps into what Larson was trying to capture- that group of people right on the edge- on the edge of love, artistry, addiction and life. 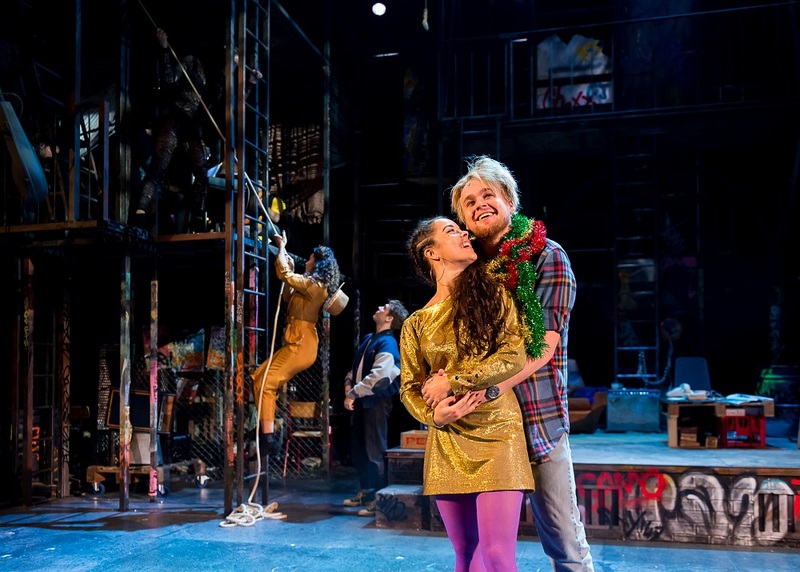 The cast- some of whom were I think born the same year Larson wrote Rent- bring out new perspectives in these characters and remind us of the real joy in revivals of classic pieces-that there’s always something new. Meanwhile Guthrie has in rebuilding it managed to make moments that never seemed to quite work, quite literally sing. But this is getting close to review territory-I’ll get to that ‘Another Day’. The point being something happened in that theatre, I saw new things in a piece I thought I could get no more from. More importantly, I remembered exactly why I dove so deep into this piece to begin with. Sitting in that theatre I felt like I did all those years ago, the combination of being simultaneously ripped apart and hit by lightening that only really good theatre can do. And with it for me, all those years of Rent being a part of my life simmering and overflowing (which is a neat metaphor for saying I cried my face off). 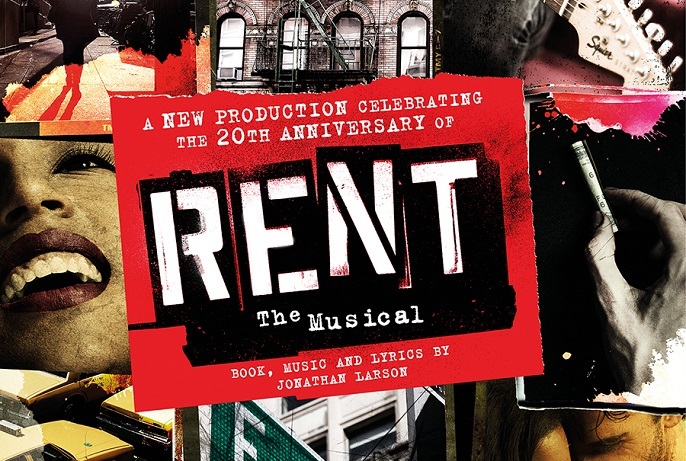 I have loved Rent for half of my lifetime, but like many a familiar thing, I let some of it slip away. I got cynical. Over the years, in academic circles I’ve found myself dismissing it. I heard the words ‘well of course X piece is an excellent piece of drama, while Rent, well that’s just something I love.’ I sheepishly defended it as ‘always a bit unfinished’ or ‘of it’s time’ ‘Important for it’s popularity’. I slowly felt myself believing what the dismissive people say about it- that it was overrated, that it’s just a musical, that it got lucky, that (and I still hate this one) only because of Jonathan Larson’s death did it gain the popularity. I got sick of defending it’s success in the UK. I got sick of defending it as worth defending, and I think part of me resigned. Wrote it off as my own youthful foolish love. I even have have a line, that I trot out when asked which of the plays I wrote about my PhD is ‘the best’. I always say ‘Well Angels in America has my head, it’s the intellectual one. But Rent has my heart’ It’s always been my cop out, acknoledgeing that people don’t really regard it as worth talking about, my little musical. But that does a disservice. But I was wrong. In stepping back, and seeing it again, in seeing what it can be. I am back, and fighting for Rent with everything I have. With all the fire I had as a teenage, first generation Renthead, I stand and say this is an important work. 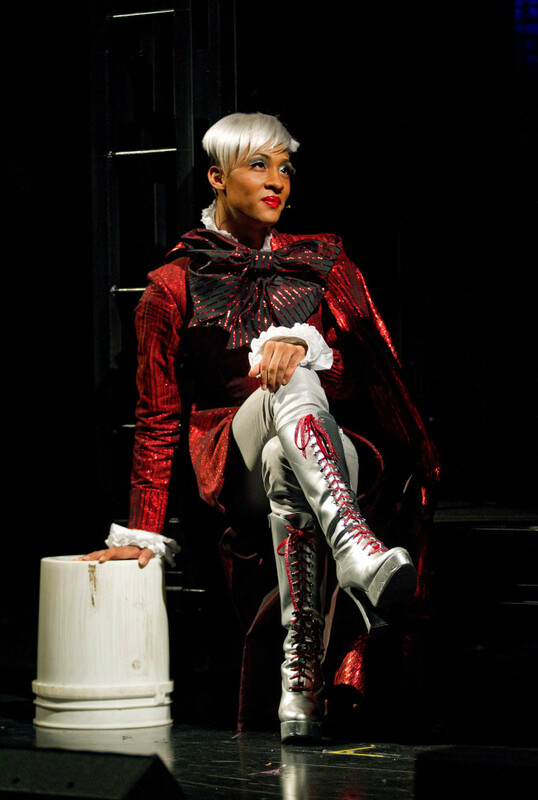 And it is SO important to the theatrical dialogue on AIDS, it is important to our theatrical canon. And above all that it’s important because of what it has done for those who love it.So in this blog post, and in the damn book I will eventually write about my PhD (that will have this production in it) I say no. Enough. Rent is important. And above all that, it’s important to the people who love it. I To me, to others like me, and to Jonathan. Because if nothing else did he not teach us to ‘measure in love’. In loving this musical for half of my lifetime, I have changed. I found Rent when I lived in a country far from home and everything in my life was turning upside down. It’s been with me through so much. It has become a part of me, it has led me to things, experiences and people I never would have met. It’s been a shared love with my Mother, and the reason I met one of my closest friends. It is music that has comforted, inspired and motivated. This weekend I got to sit in a theatre and share that experience with an audience again. They were a mix young and old (the lady in front of me was 70 if she was a day!). From the conversations around me, long time fans and newcomers. And when in those key moments the audience sat suspended with only soft sniffling heard, or the joyous electric moments, it felt like at last I found that magic that had brought me all that way, and back again. Everything has changed since Rent first came into my life, but it felt like I got my old friend back this weekend, and fell in love all over again. I may never find the right words to describe what this musical feels like to me, but as we’ve said for over 20 years now; Thank you Jonathan Larson. And I add to that, thank you Bruce Guthrie and the company, for giving it back to us.